Yes, I am at it again. 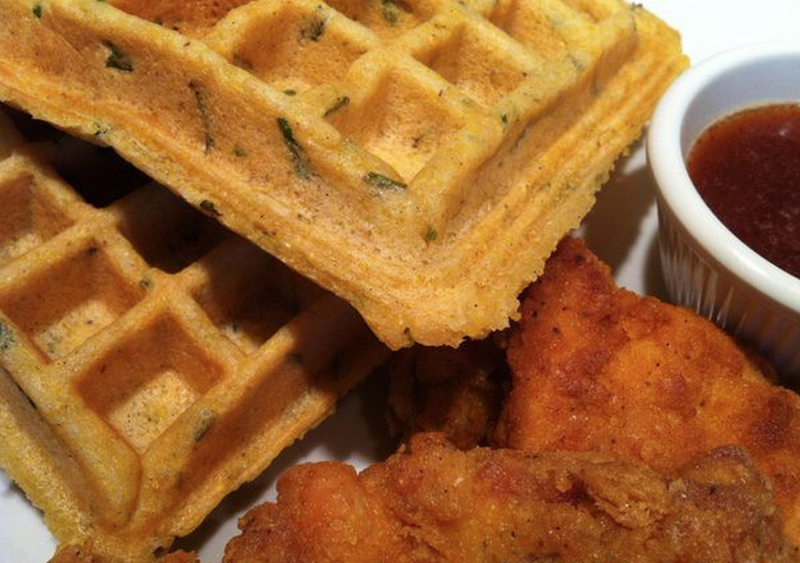 Fried chicken and waffles are on the menu today. Forget the gluten and buttermilk, we don’t need that stuff to make some amazing crispy fried chicken, or waffles that will knock your socks off. Then dip into my honey tabasco sauce, oh my oh my, you’re gonna love this. And by the way there is no need to pat them on layers of paper towels. Oil temperature is key to non-greasy fried anything. Every now and then, well more now than then, my nutritionist side takes a long day off. Though I feel eating healthy is so important for optimal health, I do also feel one needs to have foodie indulgent experiences. Today was one of those foodiedays where there were bursts of salt, sweet, spice, and tang all in one bite. I used Bob’s Red Mill Corn Bread Mix as my base for the waffles making this recipe quick and easy. For a dipping sauce, I made some honey tabasco sauce you will just LOVE! These waffles are downright dangerous with fried chicken, which, by the way, is not deep fried- just a teeny bit healthier. 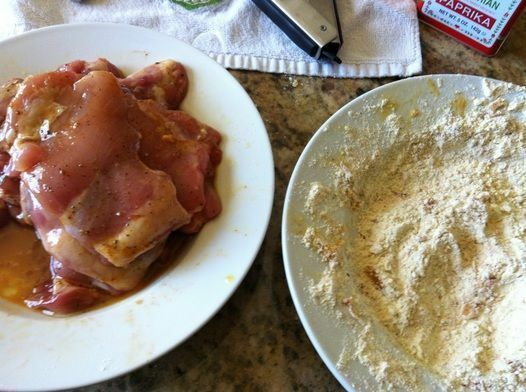 I use boneless chicken thighs rather than bone-in to speed up the cooking process. Trust me, I did not sacrifice any of that crispiness we crave when eating fried chicken. After my morning run, which I couldn’t really focus on because all I could think about was this brunch I’m about to eat, it was exactly why I love to make Sunday brunch. The first time I made this (have been many since then) was because I was getting a bit tired of cornbread. I know, who can get tired of cornbread, but I was inspired to test out a new recipe. 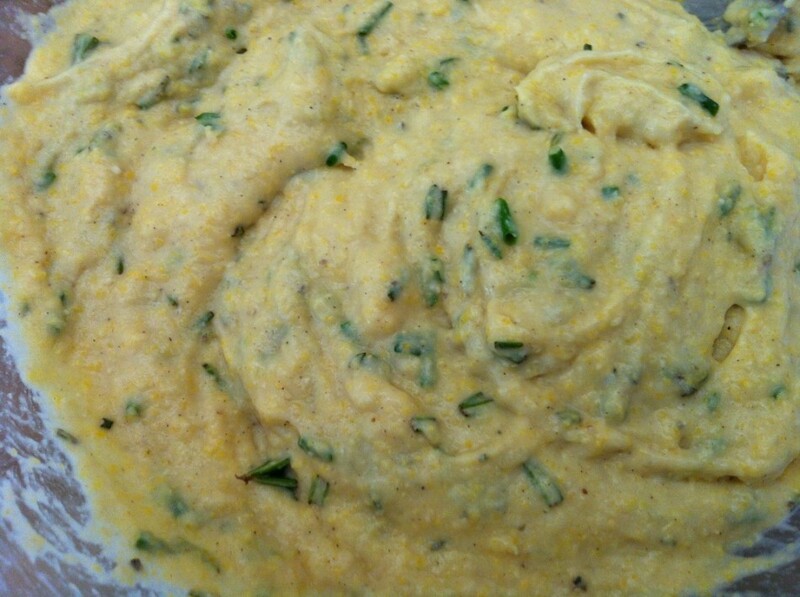 I thought rosemary and chives go so well with cornbread as well as chicken, no make that fried chicken. Savory Cornbread Waffles it is. My healthy and foodie sides battling for the win once again. Let me know if you had that OMG foodie moment like we did over here…enjoy! *Please read the whole recipe before beginning so that everything will be ready at the same time. I generally make the honey tabasco sauce first to get it out of the way. 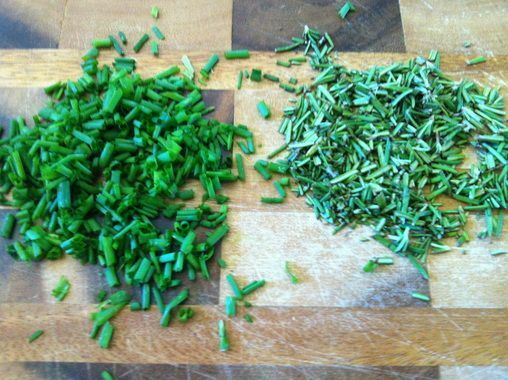 Chop up chives and rosemary. Love fresh herbs. Place all the chicken on a baking sheet or cutting board, season both sides evenly with 1 tablespoon of kosher salt. 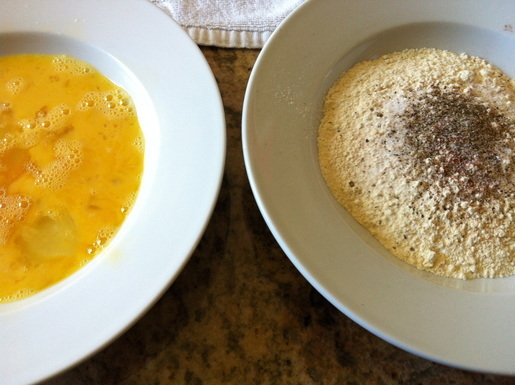 In a shallow bowl scramble the eggs add a small pinch of salt, set aside. In another shallow bowl combine biscuit flour, 1/2 tablespoon of kosher salt, crushed black pepper, paprika, and garlic powder. Set aside next to the eggs bowl. Set a large skillet over medium high heat, when skillet is hot add oil. Meanwhile begin dredging only a few pieces of chicken (once the first batch is cooking then continue to dredge and flour, set aside). First dip the chicken into the egg then into the flour, gently pressing the chicken to have the flour stick to it. I use one hand for egg dipping and the other for flour dipping to prevent clumps of egg white forming in the flour mix and on my hands. The oil should be very hot by now. Test it by dropping a little bit of flour, when it quickly sizzles, it’s ready. 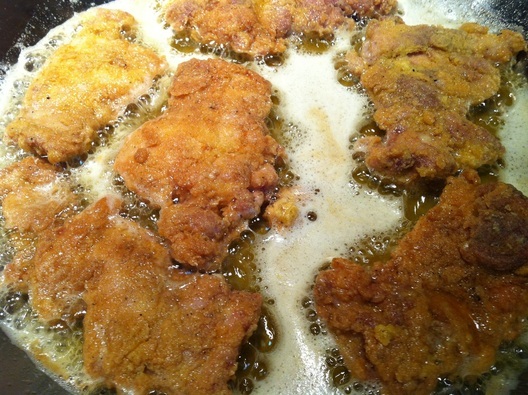 Gently add each piece of chicken slowly, do not overcrowd the pan, otherwise, it will not get crispy. Cook on each side 4-5 minutes. Transfer to a cooling rack over a baking sheet or onto a plate. At this point I turn on my waffle maker (I have my waffle batter prepared and set aside before making my chicken) and wait a few minutes for it to get hot while I begin to dredge and cook my second batch of chicken. Gently and slowly put the remaining floured chicken into the pan. Again, cook for 4-5 minutes on each side. Meanwhile prepare the waffles and sauce, per instructions below. 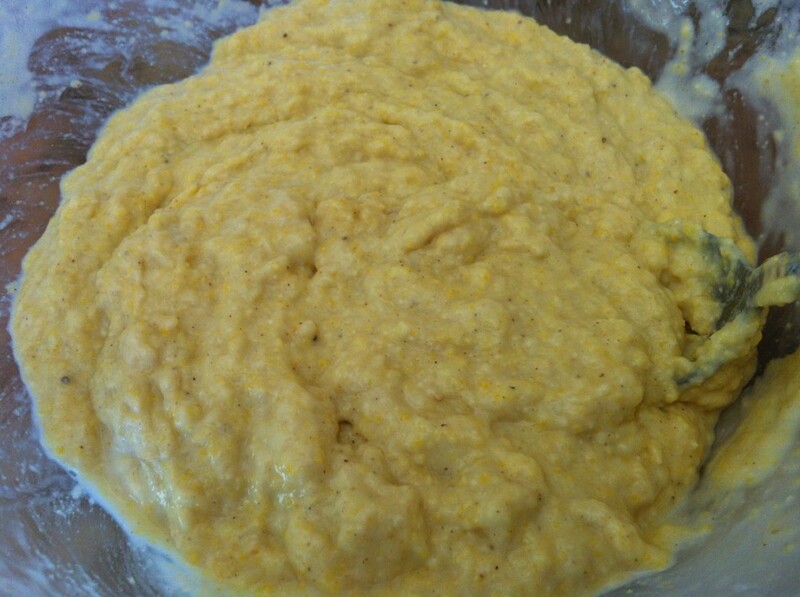 Follow instructions on the back of the cornbread mix , once the ingredients on the cornbread mix have been blended (I use a hand held mixer for this recipe), add almond milk, and oil, mix to combine. When the waffle maker is hot, ladle the waffle batter into each waffle mold. Cook for 3 minutes (set a timer) or 3 minutes 30 seconds maximum. Please Note: More cooking time will result in a crispier waffle. Combine honey and tabasco sauce, serve in little condiment cups. 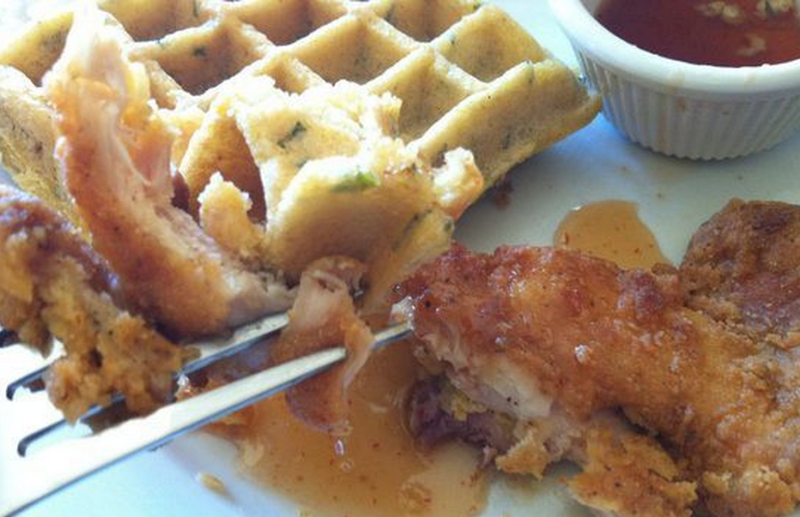 Serve waffles with fried chicken and honey tabasco sauce. Can you taste it? OMG! Just LOVE a good brunch, don’t you? 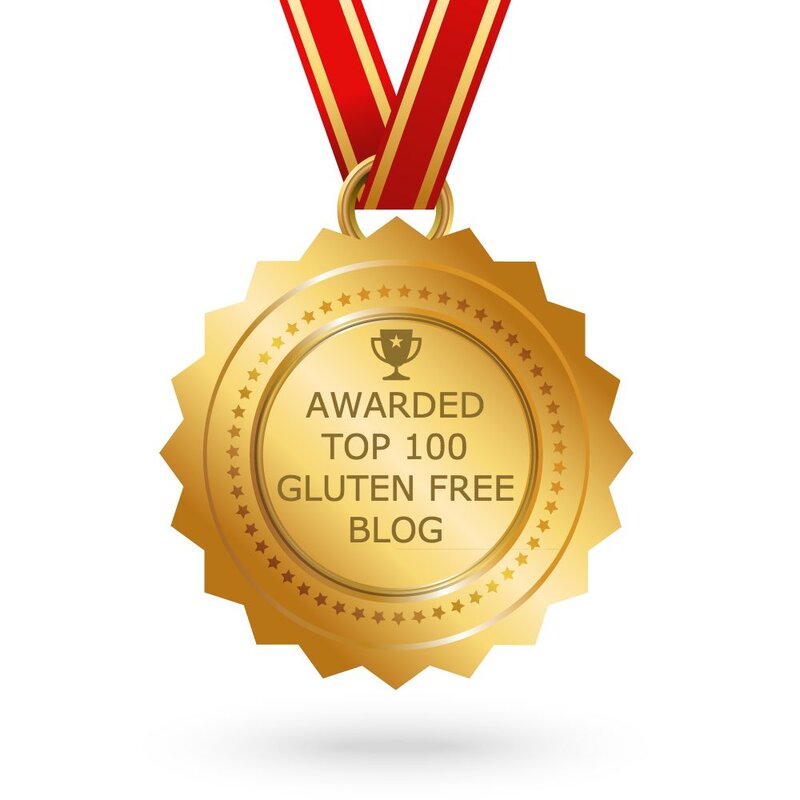 I've been on a gluten free diet most of my life and I never had fried chicken that I could say was yummy. I gave up eating waffles a long time ago because gluten free translated into eating cardboard. I don't know why I made your recipe, probably because it looked good in the picture. Now I know what the fuss is over chicken and waffles. This recipe is incredible. 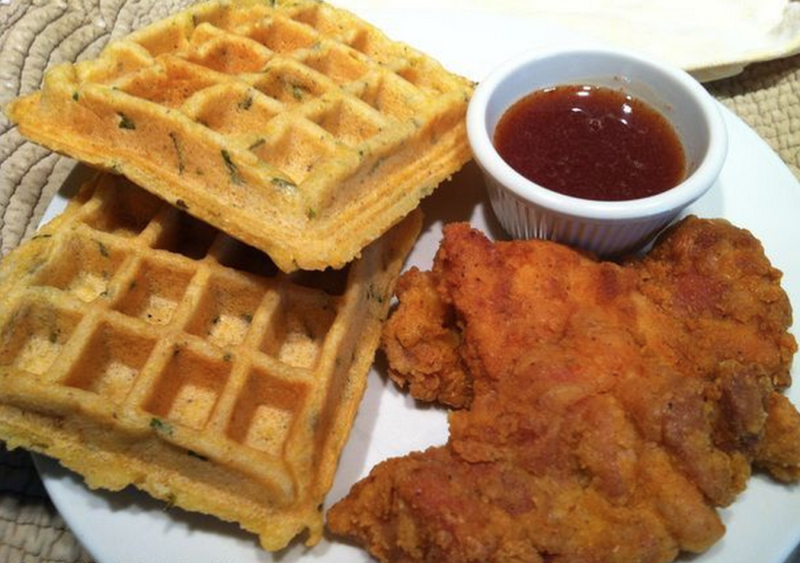 The chicken is moist on the inside and crunchy on the outside and the waffles have a great texture and special flavor from the spices. Jessica, where have you been hiding? I can't wait to try some of your other recipes. How did you know ive been dreaming about this? Me too! All the time. I made this today per my partner's birthday brunch request after finding your gluten free recipe. Frankly yours looked the most appetizing, and wanted to tell you that we all ate it like vultures. 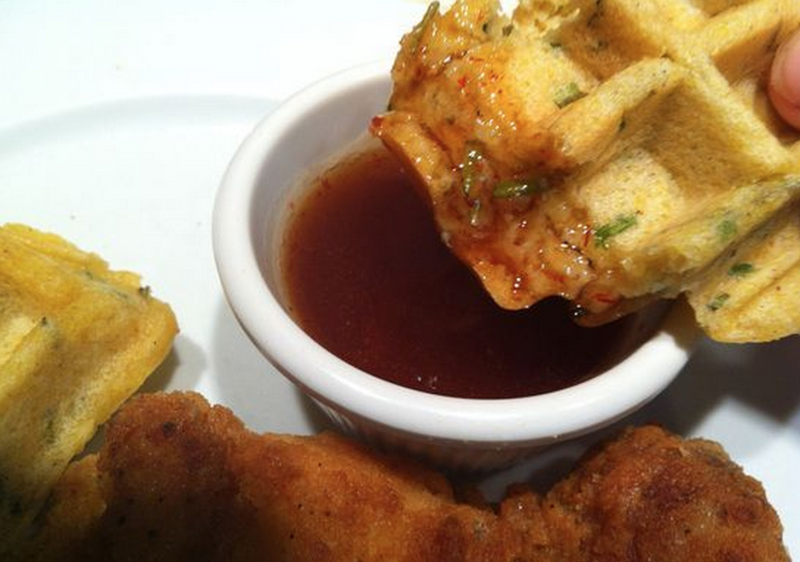 I loved the savoriness of the waffle with honey tabasco sauce, my new favorite sauce. Everyone loved how crispy the chicken came out. He was the happiest birthday boy ever!! Aww, thank you. So happy you and birthday boy enjoyed it!! Sorry Sheri-Lynn your comment slipped through the cracks, I'm sure you got the best chicken but for what it's worth any chicken will do, preferably non-gmo, organic to avoid arsenic (in the feed of gmo non-organic chickens). Enjoy! All the flavors went so well together, this is a terrific and ridiculously flavorful recipe I will be making again and again! Thanks for sharing your recipe!! My daughter has been begging me for chicken and waffles for a long time. Came across your recipe on pinterest and decided to surprise her with this birthday meal. It took more time to make than I thought but was worth it. She loved it, we loved it, my parents and in laws all loved it! Thank for sharing the recipe, it was more than I hoped for. Will be trying the mac and cheese next! Aw, thank you for sharing Renee that is SO wonderful to hear! Enjoy and happy birthday to your daughter! !